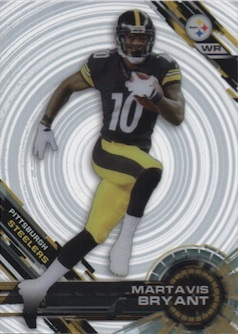 With 2015 Topps High Tek Football, the freshly rejuvenated brand hits the gridiron for the first time. Putting variations at the forefront, the product is a challenge for player collectors. That said, its mix of acetate and foil patterns take designs to extremes. Boxes come with a single pack, each one promising an autograph. During its initial three-year run in baseball from 1998 to 2000, Tek was synonymous with its wild look and daunting amount of variations that drove collectors to the brink. While the variations returned in the resurrected 2014 Topps High Tek Baseball, the number of variations was much smaller and easier to keep track of. 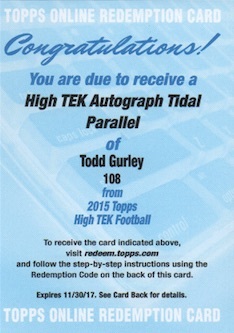 That's the case with 2015 Topps High Tek Football. While each base card has multiple versions, they won't be measured by the dozen. The checklist features a mix of veterans, rookies and retired players. Cards are done on clear acetate stock. Backgrounds use foil to make for dynamic patterns. Patterns aren't the only variations. Ten players also have Retro Uniform short print variations where they're shown in throwback gear. Base versions are numbered to 50, which should make them a little easier to spot. They also have Red Orbit (#/5) and Black Diffractor (1/1) parallels. While base cards have different variations based on the pattern design, the main patterns also have parallels. These come with names that live up to the wild designs: Purple Rainbow Diffractor, Confetti Diffractor, Tidal Diffractor, Gold Rainbow Diffractor, Clouds Diffractor, Red Orbit Diffractor (#/5), Printing Proofs (1/1), Black Galactic Diffractor (1/1) and Black Rainbow Diffractor (1/1). In addition to these, some of the pattern variations also have Red Orbit Diffractor and Black Galactic Diffractors. 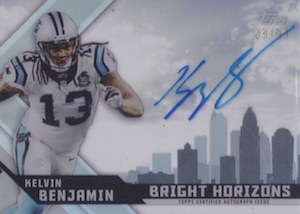 High Tek Autographs make up the majority of the signed cards in 2015 Topps High Tek Football. All come with on-card signatures and are essentially like a base parallel. Like the regular cards, there are several parallels: Tidal Diffractor, Gold Diffractor, Clouds Diffractor, Red Orbit Diffractor (#/5), Printing Proofs (1/1) and Black Galactic Diffractors (1/1). 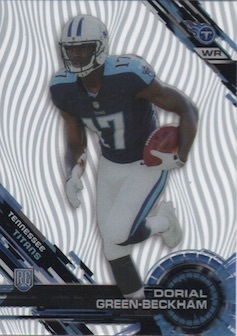 2015 Topps High Tek Football has a few basic inserts that take a page from its baseball counterpart. Bright Horizons (#/50) showcase young players with a design that mixes acetate and skylines. 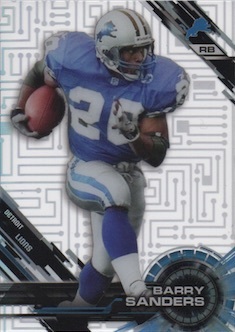 DramaTek (#/50), an insert that debuted in 2000 Topps Tek Baseball, highlights top NFL players. Both of these have Red Orbit Diffractors (#/5), Black Galactic Diffractors (1/1) and autographed versions. Low-Tek Diffractors (#/50) take a design that started in the previous year's baseball set. They also have autographs. 2015 Topps High Tek Shaq Thompso GOLD DIFFRACTOR RC AUTO SP 30 50 AUTOGRAPH! 112 cards. View a detailed guide and gallery to the base patterns. 10 cards. View a detailed guide and gallery to the retro variations. Good: Quality designs, on-card autographs, mix of patterns. 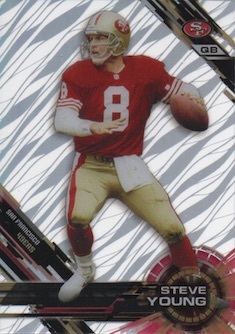 The Bottom Line: Basically an offshoot of the baseball version, Topps High Tek Football is a short and sweet break. The on-card autographs are a huge plus and look great but it is a little disappointing that the product is not redemption-free. 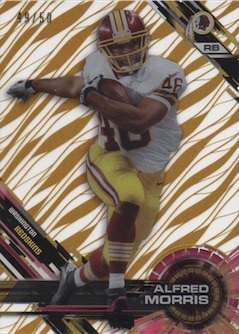 Acetate stock and action images are set against foil background designs for an impressive result in the base set. Although it does nothing to separate itself from the baseball product, I have no issue with Topps’ decision to keep things basically the same. However, it would have been nice to mix things up a little to set it apart slightly. Most important for collectors, all the autographs are signed on-card. Throw in a few limited inserts and retro variations and there is really not all that much to High Tek except for the patterns. Focusing heavily on rookies and former greats, it appears that many current stars were sacrificed in the checklist. While it is easy to make peace with Hall of Fame subjects, there are some very questionable names among the rookies. This is especially disappointing given that this release comes well into the season. Also like the baseball set, base patterns are broken down by player groups. However, it is odd that the groups are not evenly distributed. There are a fair amount more Group A cards since they include the first 72 subjects in the base set and the remaining 40 are only found with Group B designs. One thing to note is that autographs for Mariota and Gurley are both issued as redemptions. Value is especially tricky for 2015 Topps High Tek because while the $50-60 box price sounds reasonable, there are only eight cards per box. 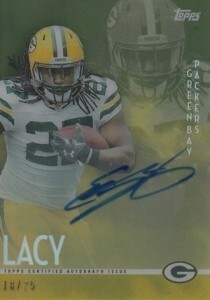 Even with the guaranteed autograph, the uneven checklist makes this a bigger gamble by the box. Helping things somewhat, the more limited patterns and parallels can be a saving grace. I greatly enjoyed High Tek. The collector in me would have liked a few more packs of cards in the box, but even with eight cards, it is easy to appreciate the quality. It’s hard to complain when you pull an on-card autograph for one of the top rookie names, but it is still a little deflating to end up with a redemption as your only hit. Given the simplicity of the set and the push by Topps for redemption-free releases, it would have been nice to have all signed content live in the product. 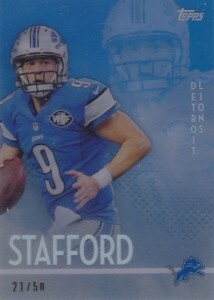 Nevertheless, sets like this make it more disappointing to think about the Topps void coming for NFL products in 2016. STEVE YOUNG 2015 TOPPS HIGH TEK "AUTO" #'rd 2 25 !!! Only 25 MADE ! It’s nice to have Hall of Fame players autographs but why include so many legend players in the base set? Why do they exclude so many good veteran players playing in the league now? It’s all rookies and legends. Also why is Terrence West in this set as a Brown? No gronk on the checklist, but they release him as an image for the preview. Trae Waynes is the ONLY Viking in this product?? What about Adrian Peterson an MVP of the fricking league.. Not even a promising rookie like Diggs is in here..REALLY TOPPS??? NO STARS, AVOIDING THIS LIKE THE PLAGUE. Another thing. Topps Redemption program is a SHAM, FRAUD, NON EXISTANT AT TIMES, AND SHOULD BE ELIMINATED! DO NOT TRUST REDEMPTION CARDS FROM TOPPS, YOU WILL PROBABLY NEVER GET THE CARD AS ADVERTISED!! They don’t care if you don’t get your redemptions, they just want your money!! That’s straight up Homies! I like High Tek football. Reminds me of clear vision but with more autos. Note: This says that there are 10 cards in a box. This is incorrect. There are 8 cards in a box.